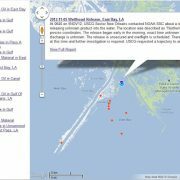 We’ve been seeing a steady stream of National Response Center (NRC) oil spill reports lately through the SkyTruth Alerts system, clustered in East Bay off the Mississippi Delta in the Gulf of Mexico. There’s a bunch of oil platforms out there, mostly small and unmanned (you can see a few of them in detail on Google Maps). The NRC reports typically describe one-time leaks and spills of very small amounts of oil, but the frequency of reports in that same vicinity over the past two months definitely caught our eye. 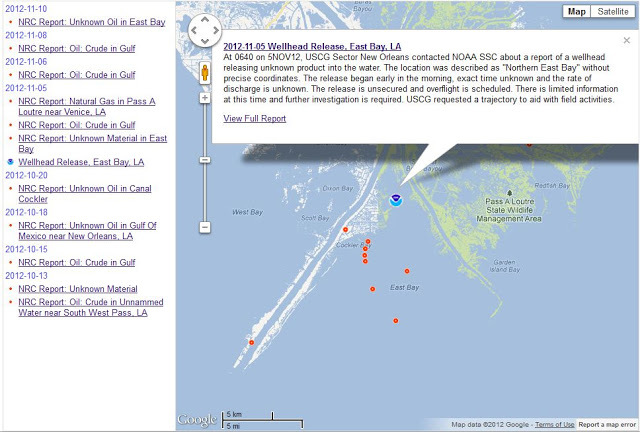 Even NOAA got involved, investigating a report of a leak from a wellhead (a small unmanned platform servicing a single well). SkyTruth Alerts map of East Bay showing recent pollution reports from the National Response Center (red dots) and investigation report from NOAA. 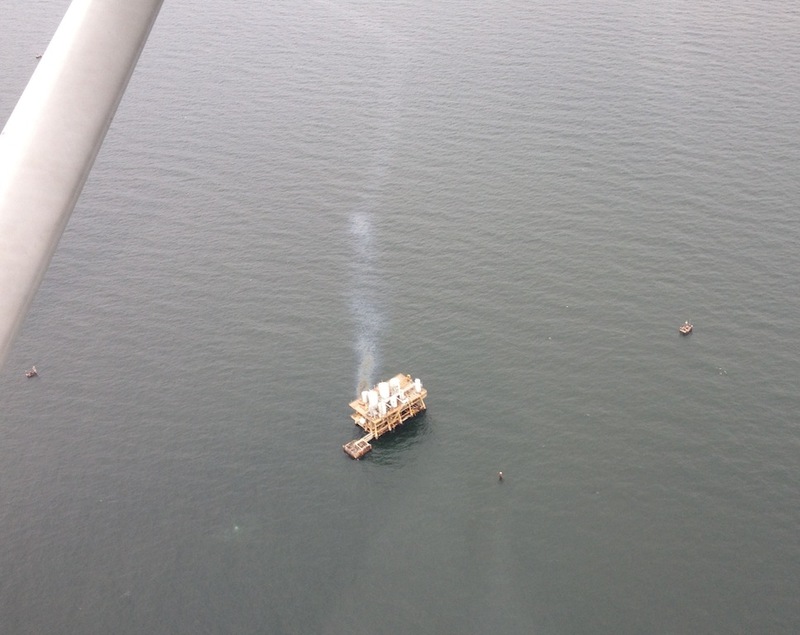 Bonny Schumaker, tireless pilot and Gulf pollution watchdog, flew out over East Bay on Saturday (yes, she also flew the notorious Taylor Energy chronic leak site just the day before). Sure enough, she spotted a leak from one of the platforms in East Bay. Here’s her video, and a few pics of the leak (here is the platform in Google Maps; the location is 28.998579° North / 89.281001° West). As far as we can tell at this time, aside from Bonny’s report this particular incident apparently hasn’t been reported to the NRC as required by law. Another example of systematic underreporting of oil pollution in the Gulf? 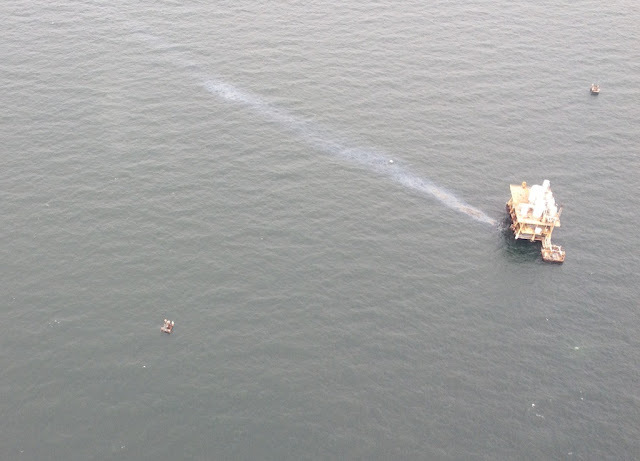 Small oily leak from platform in East Bay, Gulf of Mexico, on November 10, 2012. Photo courtesy Bonny Schumaker / On Wings of Care. Same platform on November 10, 2012. Photo courtesy Bonny Schumaker / On Wings of Care. Last January, fellow SkyTruther Sara Scoville-Weaver wrote an article, Black Ice Is Never A Good Thing…, about potential drilling in the Arctic Ocean and how a large oil spill – like the one caused by Shell and spotted on satellite image by SkyTruth last December off the coast of Nigeria – could affect the waters off the coast of Alaska where Shell is now poised to commence drilling. 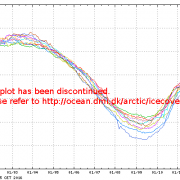 Since then, we have been monitoring the changing sea ice using data published by the National Ice Center at NOAA. 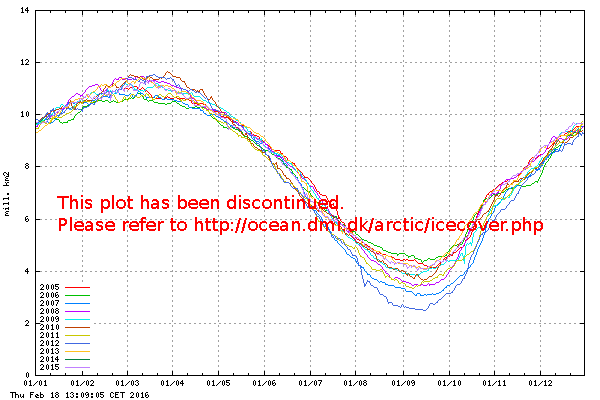 The sea ice extent varies dramatically from winter to summer, and even the daily variations can be substantial. This graph that we got from the Danish Meterological Institute shows the average Arctic ice coverage over the course of the year, in millions of square kilometers. As you can see, August (01/08) marks the beginning of the part of the year with the least ice coverage; the lowest being through the month September (01/09). The black line indicates this year (2012). Shown below are a series of sea ice maps from the National Ice Center covering the last three weeks. The large white portions represent thick ice coverage, the grey is thin or broken up ice. 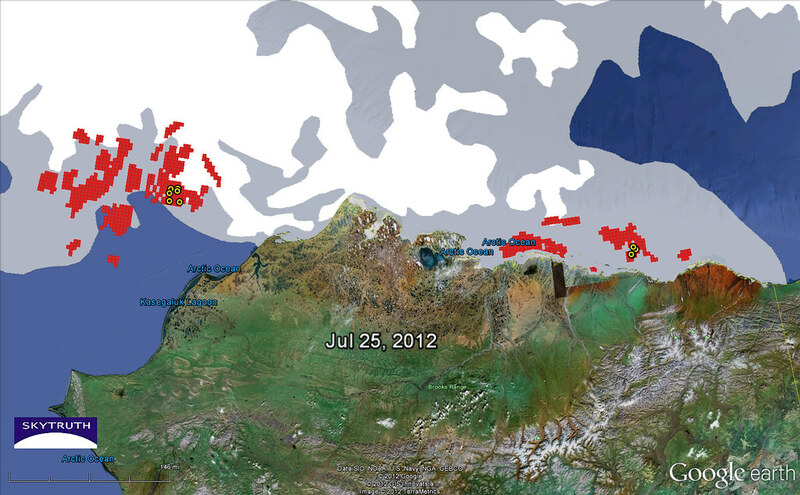 Red squares show lease blocks which could be potentially drilled. 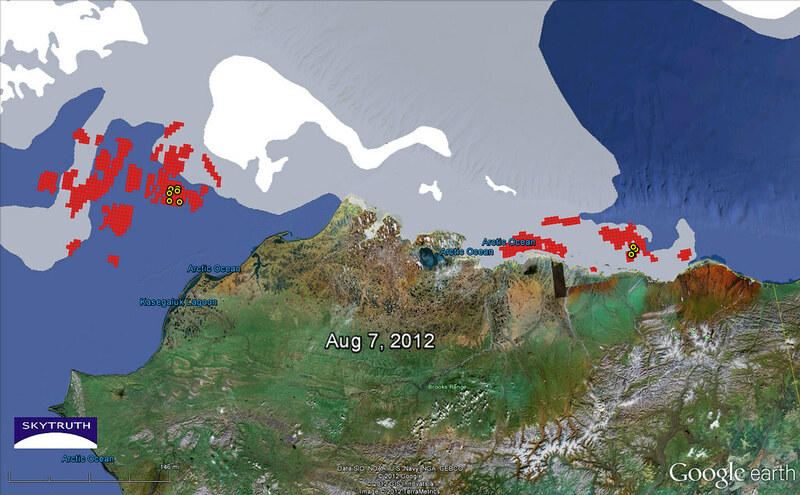 The yellow points are Shell’s planned drilling locations. 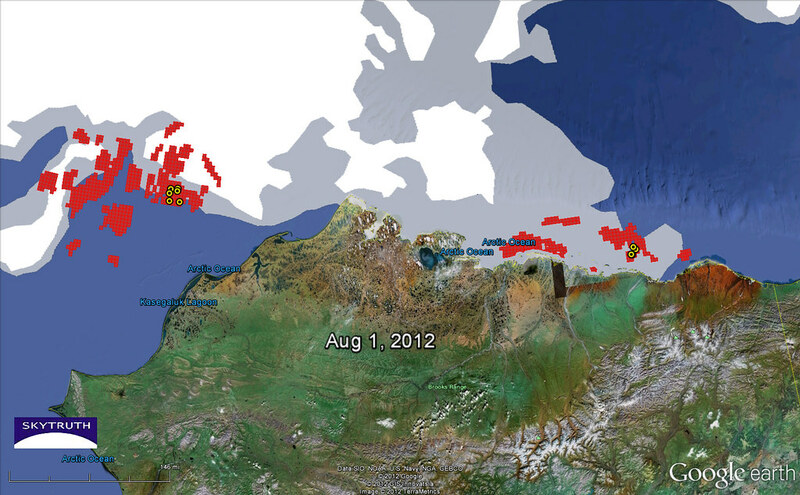 Images showing recent weekly change in sea ice coverage in the vicinity of Shell’s planned offshore drilling sites. 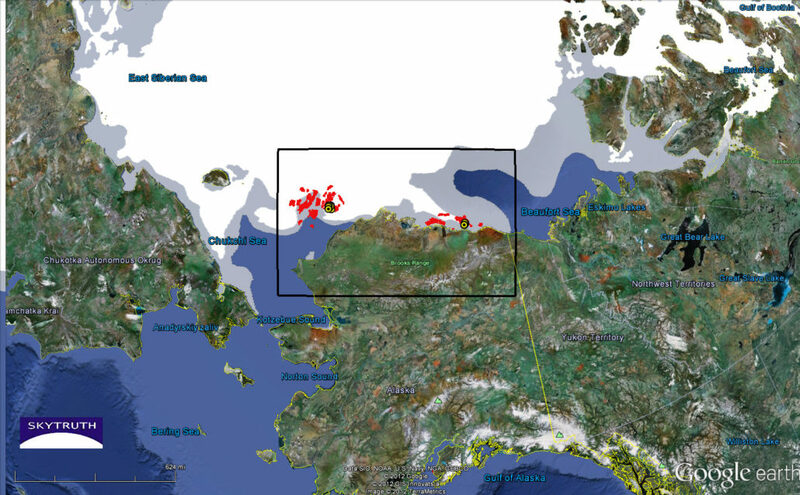 As you can see, even this far into the summer season, Shell’s planned drilling sites are still impacted by sea ice, and the ice coverage is still changing drastically from week to week. We shudder (or shiver) to think what it would take to mobilize an oil spill response on the scale of the response to BP’s 2010 disaster in these icy, unpredictable conditions. We built SkyTruth Alerts to give us a heads up whenever something happens that we might want to investigate with satellite imagery. But we figured if something happens that we want to know about, you probably want to know about it too. 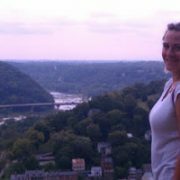 It’s the easiest way to get info about oil and gas drilling activity in Pennsylvania and West Virginia, and accidental spills and releases to air, land and water of oil and other hazardous materials throughout the US and territories. It also includes special SkyTruth reports on oil spills and other incidents world wide, like recent spills off Nigeria and Brazil, and the bilge-dumping evidence we blogged about yesterday off Vietnam. And because I’m a geeky geologist, we’ve included global reports from the US Geological Survey on earthquakes of magnitude 5.0 or greater. The lazy part? You can use the map to zoom in to your particular area of interest, then click on the RSS or email icons to get an RSS feed or a single daily email report whenever anything new pops up in that area. Then sit back and let the info come to you…. SkyTruth Alerts map at 10am on February 24 2012. 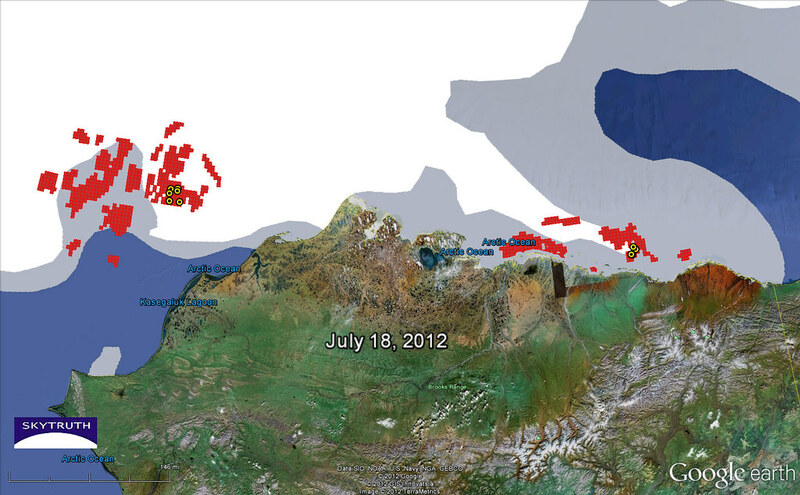 Drilling activity (new permits issued; drilling commenced) shown as colored triangles; pollution incidents shown as red dots. https://skytruth.org/wp-content/uploads/2012/02/SkyTruth-Alerts-WV-PA-24feb2012.jpg 571 640 John Amos /wp-content/uploads/2016/08/test_logo.png John Amos2012-02-24 15:48:002019-02-21 09:29:58Lazy? Try SkyTruth Alerts! Drilling Alerts: SkyTruth Kicks It Up a Notch for 2012! A new year brings new possibilities here at SkyTruth! For us, that means an amazing new portal of drilling data and maps for easy access and download. 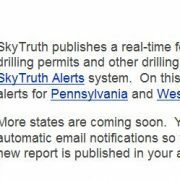 SkyTruth Drilling Alerts is a compendium of datasets, links and news to give any concerned citizen the tools necessary to become informed about the issues that matter most to them. We have created a live system of alerts for the public to subscribe to, providing up-to-date notification of drilling events in Pennsylvania and/or West Virginia (other states are on our radar). As soon as we know, you know! Click to visit the SkyTruth Drilling Alerts site! The site also showcases our mapping work showing drilling throughout the Marcellus shale region. Maps that highlight levels of drilling activity by county and watershed are provided in printable format as well as in interactive form for more dynamic, searchable viewing. These maps are designed to help concerned citizens get organized to perform regular tests of water quality in streams, creeks and rivers where drilling activity is highest and impacts to water quality are most likely to be occurring. 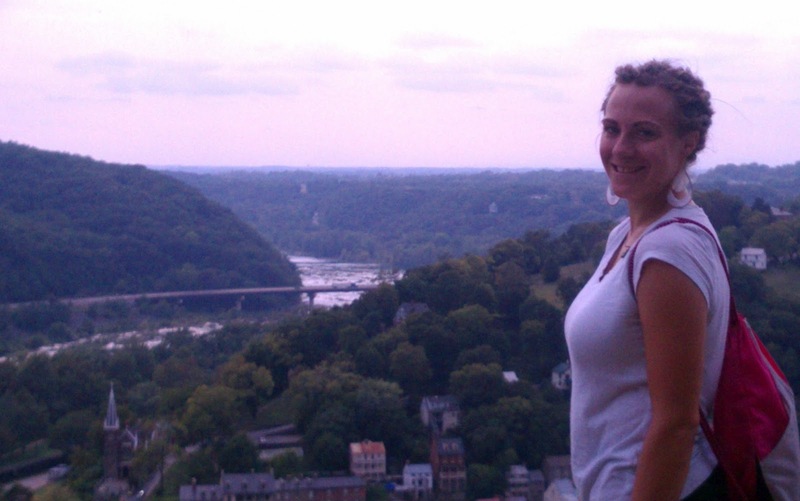 As new shale-gas drilling spreads throughout Pennsylvania and West Virginia, and on to Ohio and New York, such proactive knowledge is crucial to understanding if and how resource extraction will affect our nation’s valuable waterways. This site also provides visitors with recent SkyTruth news and updates as well as links to and explanations of our most useful data sources. We want this to be an informative and user-driven resource, so please do not hesitate to share your comments and suggestions for improvement as you explore! We are also calling for any and all assistance with identifying and maintaining datasets you think would be useful to include on the Alerts maps. Contact us! Be sure to follow us on Facebook and Twitter where we will be announcing additions and improvements to this site as we strive to keep our Earth and global community as clean and healthy as possible! https://skytruth.org/wp-content/uploads/2012/01/SkyTruthdrillingalerts-1.jpg 249 689 Sara Scoville-Weaver /wp-content/uploads/2016/08/test_logo.png Sara Scoville-Weaver2012-01-06 21:55:002019-02-21 09:41:41Drilling Alerts: SkyTruth Kicks It Up a Notch for 2012!